1 Heat the olive oil in a large pot over medium high heat. Brown the chicken pieces on all sides. Remove from the pan. 2 Add onion and bacon and cook over low heat for 5 minutes until onion softens. Add garlic and cook for 1 more minute. Return the chicken pieces to the pan. 3 Pour in the wine and simmer for 3 minutes. Add tomatoes, vinegar and herbs. 4 Add stock. Bring to a boil, reduce the heat and cook, covered over low heat for 25 minutes. Remove the chicken to the platter. Reduce the sauce over high heat for 5–7 minutes. 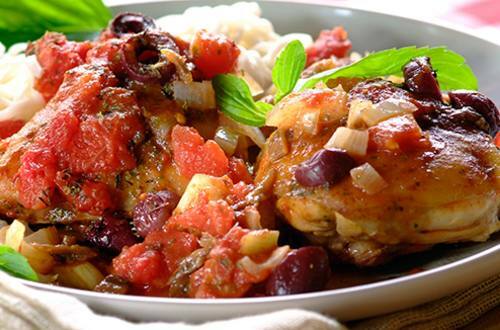 Serve chicken with the sauce garnished with parsley.